Ghana, West Africa has been drawing thousands of Black travelers for years now and the number keeps on growing. 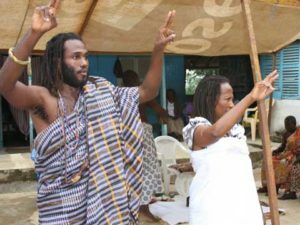 You probably landed here on this page because Ghana is one of the most visited destinations by Black people from the US and you are searching for resources to join us in Ghana. It is easy to understand from a historical perspective why Ghana is such an attractive country for Black people from the US, after all, that is where our ancestry is. Ghana has amazing food, culture, wood carvings. It’s arguably the birthplace of Pan-Africansim, kente cloth, natural landscapes, rivers, mountains, rainforests, beaches. However, that is not all- the country has many tourists’ attractions, a great culture, business incentives, and a reconnection and repatriation program calling on people to return from the diaspora. WARNING: If you are considering going to Ghana note there are many business delegations, tours, travel movements, cruises, and vacations that just exist to make money but don’t exist to empower you nor empower Ghana. We don’t recommend those as many use largely non-African/non-Ghanaian owned businesses. That means the German, Chinese, Portuguese, and other business owners get rich off of your self-discovery excursion. The Sankofa Journey has partnered with exclusively Black-owned/Ghanaian owned businesses so that as you travel dollars empower your people while they empower yours through reconnection and repatriation experiences. Before you hop on a plane or board a cruise to Ghana, you need to meet the travel requirements, so you don’t get all the way there just to be denied entry. To travel worry free it is important to know what you need. Note some locales can take weeks to process your applications. Apply early and complete all the steps so you’re application is not rejected or delayed. When you register for the Sankofa Journey we help you and have special relationships that can smooth out the process for you. The passport is the principal travel document and you will be required to furnish the embassy with one for travel approval. The passport should be at least 6 months or more to expire. There are two main types of visas for those visiting the country, business, and tourist visa. You will need to apply according to the intentions of your visit. Fill out the relevant visa application form depending on your reason for travel. The form will be duly filled and signed. First, you need to know that Ghana has an Embassy and two consulates within the US. The Embassy is in Washington DC and the two consulates are in Houston TX and New York NY. Monday to Thursday 9:00 am to 4:00 pm CST. Like most countries, the yellow fever vaccine is required for everyone over 9 months who are traveling to Ghana. You will need to present the consulate with the vaccination certificate for your visa to be processed. If you prefer to opt out of vaccinations, we have a special document for Sankofa Journey travelers you can use for legal entry. Also, ask about natural We’ll cover this in your virtual orientation meet and greet. Minors, travelers who are under the age of 18, must provide a copy of a birth certificate, copies of the guardian or parents’ government identification document or passport and a letter of consent from the guardian or parent authorizing travel, it must be signed and certified. If you are coming on the Sankofa Journey, we provide you with the proof of travel you need. These are the basic Ghana travel requirements for those traveling from the USA. Make sure that you have all your paperwork in order before you begin your journey. For those who want to move temporarily or relocate to Ghana, get consultation and information on repatriation services at repatriatetoghana.com. Thanks for reading. Click here to Register or Login to get more guides, tips, checklists, and recommendations for loving your time in Ghana.